RUSH: So the Senate has begun the process or will soon of delaying the vote on Betsy DeVos, the education secretary. This is all about teachers unions, folks, and the problem here is Susan Collins and Lisa Murkowski, who apparently get a lot of donations from teachers union donors, have announced they’re not gonna vote for her, which takes away the two-seat Republican majority. So, if things don’t change and the Democrats are trying to change ’em, it goes 50-50, and that means Mike Pence would break the tie. The Democrats are trying to delay this. This is all about the left trying to maintain control of public education of the current people ruining it. The current people that use it as indoctrination training camp rather than education institutions. The public school system, the people that have overseen the dilapidated destruction of this are desperately trying to hold on to it. 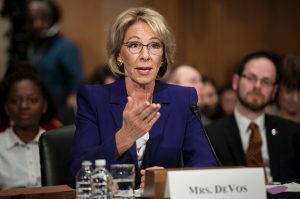 Betsy DeVos wants to wrest control from the teachers union, so she has to be stopped. The Democrats are doing everything they can. They want her to be the Trump cabinet nominee that doesn’t make it. They’re throwing up all the stops. Thomas Sowell has a great piece on this that I’ll have to get to tomorrow.